In no more than a sentence, you can capture much of spirit and desire which makes so many people want to go out and explore. In addition to the quotes, I’ve also provided my own commentary on some of the quotes to give my perspective after 11 years of traveling around the world. 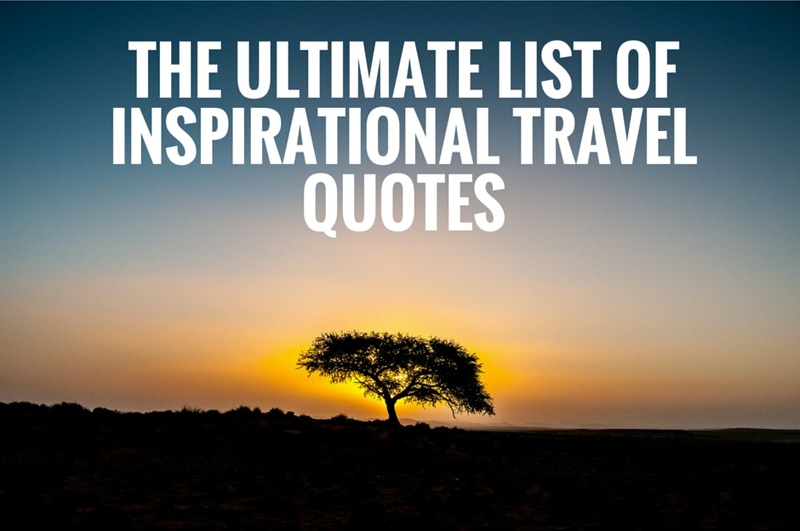 I hope you find these quotes inspiring and use them to help further travels for the rest of your life! Author Robert Louis Stevenson practiced what he preached. Born in Scotland he died in Samoa and I had the honor of visiting his tomb. He traveled halfway around the world to live on an island that few people at the time, or even today, have even heard of. Frey Stark was a travel writer to traveled extensively in the Middle East and wrote several books about her adventures. She lived to the age of 100 and lived an incredible life. Only someone as well traveled as her can know the freedom and exhilaration of waking up someplace you have never been before. This quote comes from the 1928 book “Salt from My Attic”. The single greatest thing which stops people from traveling more is fear. Even if staying at home can reduce your risk, that doesn’t mean you should stay at home. Humans are explorers and we have the spirit of exploration inside all of us. Staying at home your whole life makes you as useful as a ship that goes nowhere. If you haven’t traveled before, you will not understand the truth of this quote. There are certain cities which have a unique smell and the moment I smell it, I know I am there. Bangkok has a unique smell. Many European cities do as well. It might come from many sources including street food, sewage, pollution, flowers, and people. Stories and images can easily be shared, but smells are something which is only for those who actually travel. When I hear people who complain or object to people in other countries, my first question is always “when were you last there?”. Almost always, their answer is “I’ve never been there”. It is easy to develop prejudices from afar, but it is difficult to do when you have met these people and have looked them in the eye. Aldous Huxley, the author of a Brave New World, knew that to truly understand something, you need to see it for yourself. All of the books and experts in the world are no substitute for actually going somewhere and seeing it for yourself. Francis Bacon was a philosopher who lived in the 15th and 16th Century in England. He was influential in the development of the Scientific Revolution. I’ve met people in their 20’s who have been traveling and I have met people in their 90s. Even though they might get different things out of travel, travel has something for everyone. After traveling around the world for 3 years, I returned to my home country and I was a very different experience. After seeing so many different places, it made my look at my own country in a totally different light. It is a perspective I never would have had if it wasn’t for travel. At the end of the day, we travel to go places. Few people truly wander aimlessly. They travel to a destination and for a purpose. Airports and hotels are not the purposes of traveling. They are simply the means to the end of being able to see the rest of the world. The ideas of acceptance and toleration are a common theme in travel quotations. Benjamin Disraeli was the British Prime Minister in the 19th Century who understood that the only way to tolerate other ideas and beliefs is to encounter them in the course of traveling. If you never go anywhere, it is hard to understand why other people behave and believe what they do. Samuel Johnson was an 18th Century British writer. I can confirm what he says first hand. I’ve seen small things in my travels, from light switches to toilets, which I’ve often wondered “why don’t we do that?” Humanity has advanced through the millennia by exchanging goods and most importantly, ideas. As good ideas flow from culture to culture, everyone’s life improves. I’ve had plan journeys which have taken more than 2 days to get from place to place when you include all the flights and layovers. While I hate it at the time, I often look back on them and realize it was the difficulty in getting somewhere which made the end all that much better. 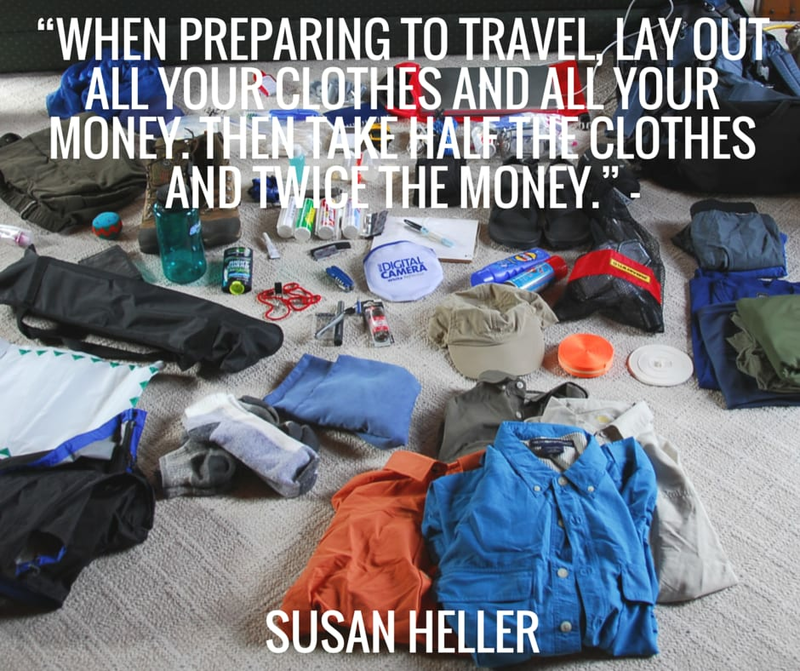 This is one of the popular and widely cited travel quotes in history. 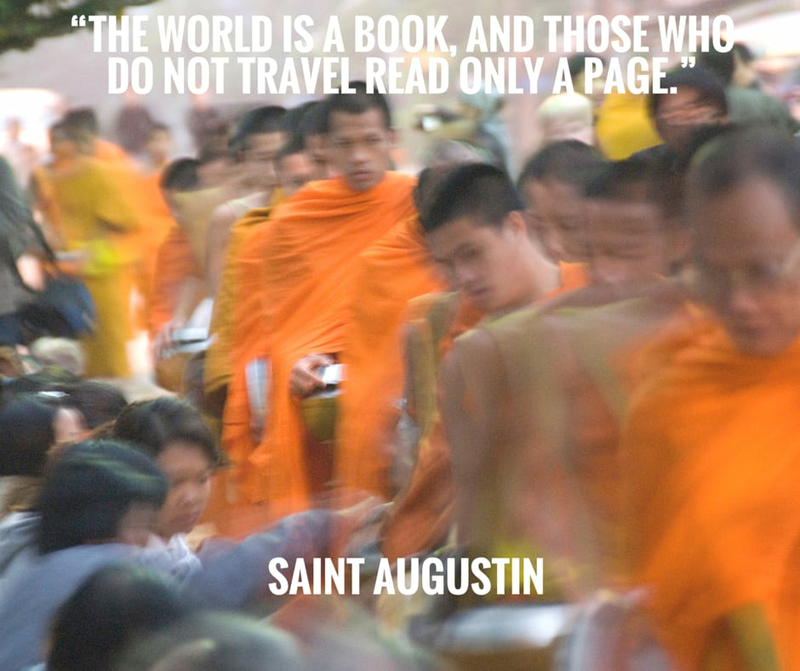 Saint Augustine lived in the 4th and 5th Century and lived in northern Africa and Italy. In an age when few people traveled more than a few kilometers from where they were born, Augustine saw more of the world than all but a few people during his life. In Tolkien’s Middle Earth universe, the Hobbits were quiet people who shunned any sort of travel. That made the characters of Bilbo and Frodo that much more heroic given the culture which they came from. Likewise, I came from a family which never traveled much. I never left North American until I was 29 years old and I never even saw salt water until I was 21! Just because you come from a place where people don’t travel much, doesn’t mean you have to as well. Proust was a French novelist in the 19th Century. He knew that the transformative changes which travel brings are the greatest gift of travel. Even though Lao Tzu lived 2,500 years before me, I found out learned what he meant. Early in my travels, I learned to keep my plans flexible and to not keep too rigid of a schedule. You never know what you will encounter when you are on the road, and keeping things flexible allows you to discover things you might never have. Without getting into a discussion of tourists vs travelers, there is certainly a difference in how people can view the world when they travel. Many people will only see what they want to see and will try to make their experiences conform to their worldview. Others will be open to experiencing and learning what the world has to offer and shape their worldview around it. Euripides was an ancient Greek playwright. 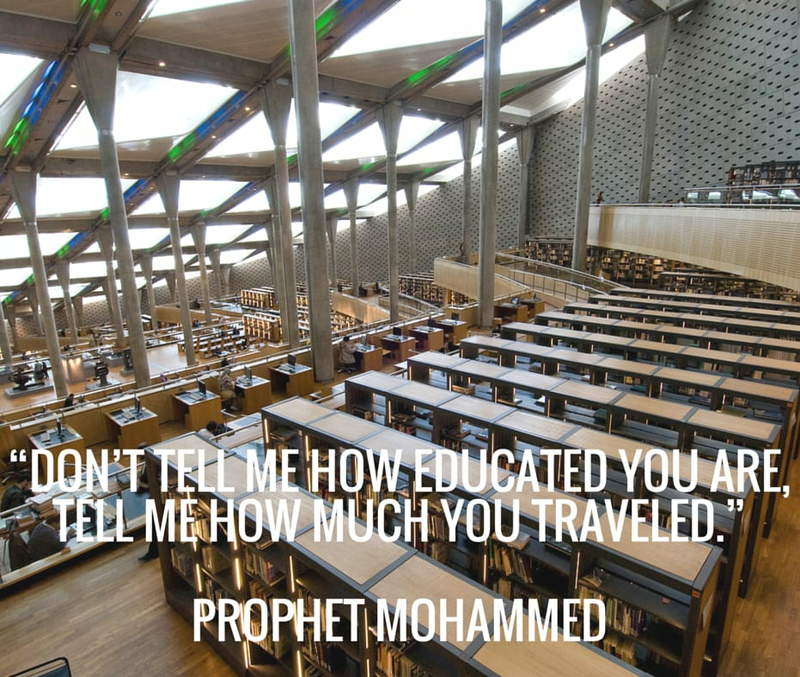 Even more than 2,000 years ago he knew that travel was the greatest school in the world. I have learned more in the years I have been traveling than I have in the rest of my life combined. Every day you are traveling, you are learning something new. John Hope Franklin was a 20th Century historian. Like Euripides, he knew that learning wasn’t confined to textbooks and classrooms. This is a quote from a well-known poem, but most people don’t consider the travel implications of it. There are a small number of places which tend to get all of the visitors. A few major cities and resort areas get the vast majority of tourists. However, the best experiences I’ve had traveling were in places which hardly anyone ever visits. Traveling is all about stories and storytelling. That is why so much of travel throughout history has been conveyed through writing. Travel photography is certainly a popular art form, you are usually capturing the place or destination, not the actual act of traveling. Writers often go somewhere new to get inspiration. Being somewhere new invigorates you in a way that being a home cannot. Even though I’ve been to over 130 countries, I still feel energized when I visit someplace new. Daranna Gidel is an author whose novels often contain a travel component. She knew that when we travel, we tend to focus on what matters and lose the distractions which otherwise rob of us focus in our lives.